Fantasy football drafts are a game of values. You're trying to decide what player fits best with your draft slot, what positional needs you have, and if it's worth it to go quarterback over running back in the first round. For the vast majority of us, we'll look back at the end of the 2013 fantasy NFL season and think, "What went wrong?" Last year, it all went wrong when you drafted Ryan Mathews over Adrian Peterson. Bust. Or, in 2011, because you took Chris Johnson and held off on taking another RB for another three rounds. Bust. Or maybe in 2008, you drafted Tom Brady in the first round. Bust. Reasons for fantasy football failures vary—injuries, bad teams, unreasonable expectations, poor luck, Father Time—these are all valid. It may not be fair to call 2008 Brady or 2012 Larry Fitzgerald "busts," because their shortcomings were largely out of their control, but what does that matter to fantasy owners? They're still getting screwed out of the fantasy points they were counting on. Anytime an owner doesn't get the expected production return on the pick based on previous seasons, the player is a bust. Hence, once elite quarterbacks, wide receivers, and running backs dominate this list, because higher picks are usually invested in these positions, making the risk-reward greater than that of a tight-end, defense, or kicker. 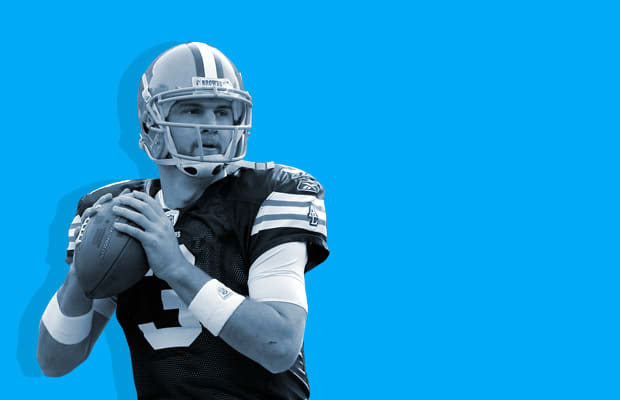 Take a regret-filled trip down fantasy memory lane and remember the busts of years past through The 25 Biggest Fantasy Football Busts of All Time. *Although fantasy football has been around for over 30 years, CBS launched the first online fantasy football beta in 1997. We'll only be judging players in this modern fantasy era.